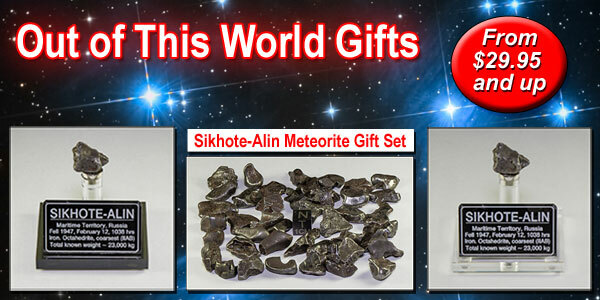 Iron Meteorite Gifts - The Meteorite Exchange, Inc.
Our Sikhote-Alin Meteorite Displays are the perfect unique gifts. We have an assortment of meteorite sizes in 6 different price rages. We select the Sikhote-Alin meteorite for you based upon the price range you select so all you have to do is click the Add To Cart button. If you would like to select your own Sikhote-Alin meteorite, stand, and label please use the following link to Sikhote-Alin Meteorites. We select the Sikhote-Alin meteorite for you. please use the following link to Sikhote-Alin Meteorites.